He Fit The Part Perfectly! Oh my goodness, we LOVED Tyson! He did SO well! The best Unicorn we had all season 🙂 He fit the part perfectly! His energy was great and I heard such great feedback on him as people were coming to me for the free socks with the flyer Tyson gave them. Thanks so much for providing us with such a great candidate. Autumn was great! Our on-site reps were very happy with the enthusiasm and professionalism she brought to our show. Thanks for the great pick! Thank You For An Amazing Experience! From the entire team here at the Blue Jays, we want to say thank you to you and all of your staff for an amazing experience at Winter Fest this year! We had so much amazing feedback from everyone who worked with your team. It’s so helpful to be able to trust an external team to support us with an event of such magnitude, and we’d be thrilled to work with you all again! I have had all great reviews with your staff and really happy to have them all on board! Everything went well. We’re very pleased with how Chelsea carried herself and represented our company at the show. Thank you so much for the awesome crew - Jolene, Kaidy & Sawin are all fantastic. Super quick to learn and eager to dive in, love it. Thanks for pulling this together for us over the holidays! It was a very busy show. He had to deal with the challenge of part of my booth being lost by the airline and not arriving until the 2nd day. We had no brochures, pens, or anything else to hand out. We had the backdrop stands with our name and information which he was able to use as a tool, but no hand-outs at all. This said, he remained unfazed and came up with several creative ways of keeping us top of mind with the booth visitors. The hand-outs were available day 2. As was the case in the last show, our neighboring booths were impressed at how he managed multiple groups at once. I was also pleased that when he arrived at the booth he needed no refreshers as he remembered the information from when he worked with us in September 2017. Talk about hitting the ground running! Thanks for arranging for him to support us at the show again. The reports and photos look great! Thanks for making the process, super smooth and easy! We had lots of interactions and all the giveaways were handed out which is great news! As for the sales, I'm glad to hear that the activation had a positive effect on sales this weekend. I think that overall, this was a huge success! I’m glad the staff enjoyed the experience. Our store teams have given very positive feedback as well. Thanks very much for bringing this concept to life for us! Everything went well on Black Friday despite the crazy lineups. The team was great and able to take direction and manage the crowds with friendly faces and conversations. Love the photos, the report and all the detail that is inside the feedback. It is great hearing about your experience promoting the brand, and I always love hearing what we can do better to improve our customer experience. Your team was great! They were all very helpful and ready to get their hands dirty. Wanted to send along a BIG thank you to each one of you and the amazing activation team we had on-site for Blue Jays Winter Fest this past Saturday. I heard nothing but amazing things about the team and really appreciate their help. It was absolutely crazy here so your support from a staffing standpoint was needed and so appreciated. I also know this was thrown at you SO last minute and am so thankful at your willingness to jump in and help get it sorted for us. I hope to work with you all again in the future and will keep you in mind for future events here at Rogers Centre. All three girls were outstanding. All three girls were outstanding. I could not have been happier. They are well trained and prepared to adapt to the situational needs. If all your people are this good, your agency should thrive. Thanks again, we will not hesitate to use your company in the future and will gladly recommend you to our colleagues. Feel free to quote me on that. He really had the conference attendees engaged. Everything went well on Friday. I was only there for a couple of hours that morning, but Kelsey was awesome! He really had the conference attendees engaged. Please make sure to send him a “Thank You!” from our team here at Blackjet. Thanks very much for arranging for him to support me at the show. For feedback I can only say great things about Ardalan this past weekend. He arrived completely prepared and started interacting with show visitors even before we had much time to go over everything. He didn't have to hear me talk to visitors first. He knew exactly what to do, and understood the site and business model. I also noticed that when I answered some more unusual or complex questions from booth visitors requiring a longer response, he discreetly listened, in order to increase his understanding and incorporate more information into his own interactions. to the booth to meet with customers (as I had asked him to do). I felt that the booth was in extremely good hands with him. Thanks very much for arranging for him to support me at the show. I enjoyed working with Ardalan very much, and hope to have the opportunity to do so again at a future show. Your team were a bunch of super stars! I heard everything went smoothly and your team were a bunch of super stars! Thank you again for working so well with us! The staff went above and beyond! Tanya: very charismatic, attentive, VERY eager to help, outgoing and professional. She went above and beyond! Timothy: simply outstanding! Timothy “gets what has to be done”. He knew to drive customers to the client’s demos without being instructed to do so. He was professional, funny, outgoing and hard working. In summary – both were absolutely fantastic. They exceeded expectations – and I feel it is important that you are aware just how incredible these 2 were on site. I would gladly put both of them in front of our client, with the confidence of knowing that they will bring professionalism and personality to the event! Many thanks for the tremendous job! Many thanks for the tremendous job on the Berczy event yesterday, it was all around fantastic, everything was so well organized, the Park, program, set up, media and community turnout so great, honestly the best Park Opening I've been to. Comments from the Mayor and Councillors, as well as many community members were so positive. I want you to know that everyone was incredibly impressed by the quality of the event, and the work your team did to pull it off. We can't say enough how invaluable your work and the event's success was to the park, our public relations, and (unexpectedly) for a community that would soon mourn one of the people who made it happen. My experience working with Tigris was amazing! A huge thank YOU for allowing this part of the event to run smoothly and seamlessly through your tireless work that included two weekends! You were such a huge help to me and I can’t tell you how much I appreciated it. My experience working with Tigris was amazing, not only for the top notch talent that was provided to my sponsors, but the reliability and service that I received was what made the experience the best. I will definitely use Tigris in future for other events as we travel across the country and again thank you for working so hard to make this a success. The report provided was excellent too and I will be sure to share that with all of the parties involved in this event. Couldn't haven’t asked for better staff! It went so well! The staff was very nice, polite, social and they did a really good job. Couldn't haven’t asked for better staff! It was a tremendous success! It was a tremendous success. Kassandra was worth the investment to the last penny, extremely professional, and a true pleasure to work with. Thanks once again! Viviane was great and really went above and beyond! Viviane was great and really went above and beyond to help us out. We have another event this coming week. We would love to book her again! The team you sent was absolutely amazing!!! Thank you for your email and following up with us regarding the event on Friday. The team you sent on Friday was absolutely amazing!!! The team was great. Very organized and I did not need to worry about anything throughout the event. I was very impressed by the team and look forward to booking more events. The team was absolutely outstanding! Jason, Lucas and Graeme were absolutely outstanding!!!! I could not have been more pleased with the promotion and it was truly because they were so amazing. Thank you very much for everything! I’m sure I will be in touch soon for our next event. The Tigris team did an amazing job! The Tigris team did an amazing job! Even under the challenging circumstances of running out of product. Thank you for all your effort, enthusiasm and commitment to making the show a success. Just wanted to chime in here and say that your team was fantastic on Friday! They arrived on time – special thanks to Amy for filling in for Jessie – and were upbeat, energetic and engaged with fans throughout the day. No staffing issues to report from our end as it was a successful event overall! Please relay to your team our gratitude for their hard work on Friday! Alice was AMAZING and loved by everyone ... great selection! We will 100% be requesting her next time we are in Montreal for sure! Just a quick note to say “Best Team Ever” The clients from Rogers loved your BA's and had a blast dancing at the Hot Line Bling activation. They were punctual, personable and professional. I'd give them an A+. Thanks again. I just got back in from Banff and from all accounts, the event was a success. Just waiting to hear final TV viewing numbers. Our team has been working exclusively with Serena’s team for our Wonderlist activations for the past year. Their business ethic, attitude and enthusiasm is unmatched in the industry. I would absolutely recommend working with/for them to anyone. What an absolute pleasure it was to work with Tigris in staffing our Grand Opening event! The events staff that were sent over (each and every one of them) were polished, professional, exuberant, and engaging. Every single one of them presented a great image for our company to our clients and guests. I would absolutely use Tigris again in the future, whether to host trade shows, serve a dinner service, or serve at a large function - you guys were amazing and thank you for helping us to create a truly memorable event! These girls were awesome! Tigris was great to work with. 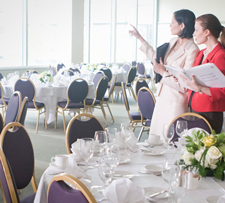 They were able to accommodate our last minute event staffing needs in Calgary and provided an incredible service. I look forward to working with the team again in the future! We have required hostesses to help run activities at golf tournaments that we have sponsored. We required staff in several different locations across the country, including Vancouver, Toronto & Saskatoon. We needed to find staff who were going to be professional, courteous, punctual and enthusiastic about our brand - and Tigris was able to deliver on all accounts. I would not hesitate to personally recommend Tigris to anybody who is looking for the same qualities and am happy to write this review on their behalf. Working with Serena and the team at Tigris was a wonderful experience. Serena anticipated our needs before we even knew we had them. We created a series of Backyard BBQ events for twenty guests sponsored by Molson Canadian Cider and Astral Radio in Toronto, London and Ottawa. Serena's team ensured that each event went smoothly and went above and beyond to give our winners an amazing experience. Tigris managed the event staffing, grocery shopping, prize pick-up, truck rentals and so much more! I would highly recommend Serena and Tigris to anyone that wants a turnkey experiential marketing event. Serena and her team at Tigris helped us with casting hosts for our online Bingo game called 'Beach Bingo'. They provided us with a wide variety of personalities and looks, and among the auditions, we found some great talent, professional attitudes and energetic personalities. Tigris aims to please and worked with us to help us find exactly what we needed. They are friendly, quick to respond and extremely helpful. Tigris made this project easy! The 3 girls who showed up were excellent, very friendly and energetic. They were on time and well dressed. We were missing one staff member and there didn't seem to be a back up plan in place which left us shorthanded. We would consider using this company again. Everything went fantastic at our Christmas Party. Jamie and Cassandra were a perfect fit! We will definitely keep Tigris in mind for any future events we have. We are so pleased to have formed an alliance with Tigris Personnel and have found them to be a valuable resource when we have needed additional Canadian staff. We sincerely appreciate their professionalism, cooperation and and high standards of service and look forward to working with them in the future. Thank you both SO much again for all of your hard work in making our Astral activation a most successful event at the Broadcast Executives Society Holiday Party! Our booth was absolutely the talk of the town these last few days, and that is 100% due to you and your fabulous team and set up. I look so forward to working with you both again very soon and will highly recommend Tigris to my colleagues. Please give me more information on your national reach. We have 84 radio stations across the country and they are always looking for great partners to work with. Tigris professionally handled our events in 2012. They were a pleasure to work with and they took a lot of the guess work out of our events and I knew I could rely on them. I have always been impressed by the level of quality service that Tigris provides. The staff at Tigris is reliable, professional and results oriented. They were able to tailor their services to meet our specific needs and it has been much appreciated. I would definitely recommend this staffing agency! I have been in the event industry for approx 32 years,as you would expect, iprefer to deal with people who are professional,effective, efficent and have ability to succeed. Tigris has all these qualities,and more. If your looking for the job to be done right, you're looking for Tigris. Tigris did a wonderful job handling our trade show display. Their staff was very engaging, outgoing and attractive! Furthermore and most importantly, they proved able to deliver the message to prospective customers exactly as we asked of them. Highly recommended staffing agency. Tigris gave me complete confidence in their ability to staff a trade show. This was our first time using Tigris and we were impressed from the first contact - great customer service, understood our needs, and delivered absolutely top personnel. To say they were friendly, prepared and professional was obvious, that they excelled at every aspect of the duties required was fantastic. We will use Tigris for future projects, it's great to know they can be counted on. We start working with Tigris this year for various event we needed staff for. Overall the staff provide was very friendly and corresponded to our needs. The Tigris team has always been able to find the amount of people we needed, even in Saskatoon,SK and Vernon,BC. One thing I really appreciate is their quick turnaround. They are quick to answer their emails, phonecalls and also to find the staff we need. Our organization has had nothing but great experiences using Tigris at various trade show's in Canada. Each time we have selected an attendant based on criteria ranging from industry knowledge to bilingual ability, we have yet to have any complaints and the services rendered were always exactly what was required for the event. I would recommend TIGRIS to anyone whom wishes to maximize their presence at a trade event. I have used Tigris several times over the past few years and have always been very impressed with the level of service I have received. Prompt attention and responses are very important to me and Tigris always performed very well in this regard. I also found it very valuable to be provided with photos of the available models to choose from. The Tigris models were always professional and courteous, and consistently left positive impressions on the consumers at my customers’ events. I will continue to recommend Tigris to all my colleagues. KS+A has worked with Tigris many, many times over the past 8 years. They have always supplied staff of the highest caliber. Beyond that they go above and beyond to understand our clients needs and always ensure that their staff is well trained before they arrive on site. Serena and the entire Tigris head office staff are professional and a pleasure to deal with. I would not hesitate to recommend Tigris for any and all promotional staffing needs. The folks at Tigris were fantastic to work with. They came into a project fairly late in the planning, and jumped right in with both feet. They were professional as well as understanding, patient and flexible. And their day-of event staff were tremendous with positive attitudes despite being in the cold, wet weather. I'm looking forward to working with Tigris again, hopefully soon! Tigris has provided Capmatic Ltd. with amazing temporary staffing services twice. In 2009 and again in 2011 during both of our events which takes place every two years. We thank you very much the beautiful young ladies assigned during our events. Both Paulina in 2009 and Victoria in 2011 were professional, friendly, sweet, in fact they were fantastic. They complemented our sales team. We look forward to working with Tigris in the near future. Great Job !!!! We had a very positive experience working with Tigris. More specifically, communication with Serena was extremely quick, efficient and helpful. Serena and her Tigris team were able to provide a vast catalogue of specific talent we were searching for, and successfully fulfilled our desired talent request. Serena provided outstanding service. She's always there to help and gives great advice. I always look forward to working with Serena.